The goal of the OHS After Prom committee is to create a life-long memory for all our juniors and seniors, by funding a safe and fun night to remember! We can not do this without your help. Please support our effort by making a donation. A SAFE, FUN AND ENTERTAINING EVENING FOR OUR JUNIOR AND SENIORS! For 45 years, an OHS parent committee has planned a safe, alcohol-free, supervised night of fun and activities following the OHS Prom. The tradition continues this year with an event that includes a DJ, games, prizes, entertainers, and food. The After Prom event creates a lifetime memory for the students of our community, and even students who choose not to attend Prom are welcome. After Prom is 100% funded with money raised by the After Prom Committee through fundraisers and through the generous support of businesses and individuals in our community, like you! Your donation will help ensure the evening’s success. 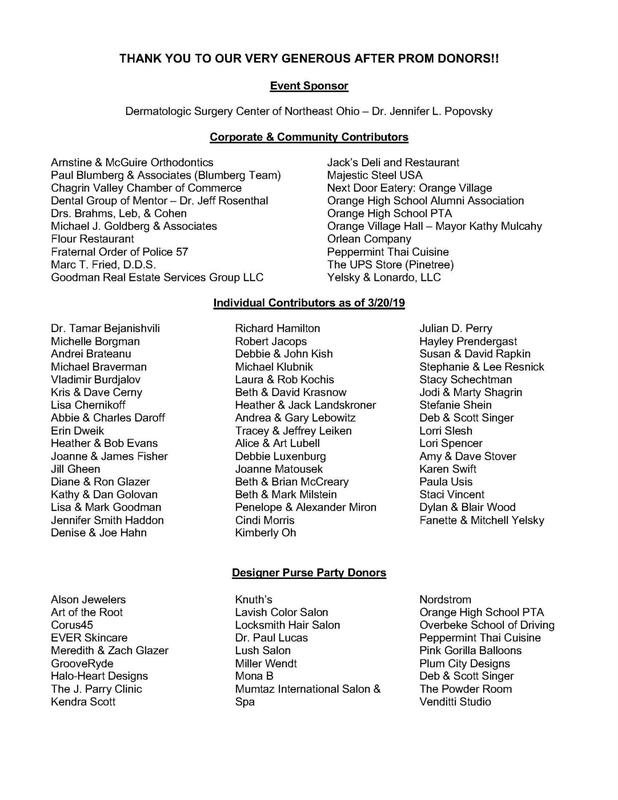 As an individual, family, or company sponsor of After Prom, you will be listed as a sponsor in the Orange Lions newsletter distributed to all students and Orange District parents several times throughout the year. Most importantly, you or your business will be recognized in our community as a supporter of our school and our community’s children. To offer your financial support of this event, please click on this link: Online Donation for After Prom, or contact us for additional information regarding donation of items that can be used for student and fundraiser event prizes. We cannot express how much your support will be appreciated by our students, their families and the Orange Schools Community. Thank you! We look forward to hearing from you.